Pete Corey Page 78 of 84 for Pete Corey | Pete Corey is an independent consultant, writer, and web developer based out of Denver, Colorado. He writes weekly articles on software development and his eternal quest to build Cool Stuff™. Written by Pete Corey on Dec 16, 2014. The other day I was playing with a fullscreen CSS layout using viewport units. I had content that was a fixed aspect-ratio, and I wanted it to fill as much of the screen as possible without overflowing. At first, I was setting the element’s width to 100vw, but of course, if the aspect ratio of the window was greater than the aspect ratio of the content, the content would overflow off the screen. In those cases, I wanted to bind the height of the content to 100vh, instead of binding the width to 100vw. Error: Incompatible units: ‘vh’ and ‘vw’. After some googling, I came across aspect-ratio media queries. This is exactly what I needed! To build my layout, I use an aspect-ratio media query to alternate between binding against vh and vw based on whether the screen is in a horizontal aspect ratio, or a vertical one. See the Pen aspect-ratio media queries by Pete Corey (@pcorey) on CodePen. Written by Pete Corey on Dec 15, 2014. Recently I decided to elevate my Linux Mint 17.1 development environment from its plebeian out-of-the-box Cinnamon origins to its rightful place among the glorious #TilingWMMasterRace. I thought I’d document the process of installing and configuring bspwm to help others looking to do something similar. ~/.Xdefaults is where you configure the look and feel of urxvt. I started with a template ~/.Xdefaults I found online, switched to use Ubuntu Mono and borrowed a nice color scheme I found in this helpful article. You can see what the final result on my github. On a system without a graphical login manager, you could simply log into your system and run startx to run ~/.xinitrc and run bspwm. However, Linux Mint uses the MDM Display Manager, which means that X is already running when we log in and we need to take an extra step to get bspwm running. Thankfully, all we need to do is make a symbolic link to ~/.xinitrc called ~/.xsession. When MDM logs us in, it will execute ~/.xsession, which will effectively execute our ~/.xinitrc and run bspwm. After making this link, log out, select “Run Xclient script” session and log back in. You should be greeted with a black screen. Hit alt + enter to open a terminal. After initially following the steps in bspwm for dummies, I noticed that doing mouse based window resizes was incredibly slow. After a little research, I found this reddit thread that suggested a fix of limiting the maximum frequency for motion events to 100. You can check out sxhkd.c on github to see how this works. Look at max_freq and motion_interval. When a max_freq is specified and a motion_interval is calculated (> 0), the motion_notify method will return early, preventing sxhkd from spamming bspwm with commands. 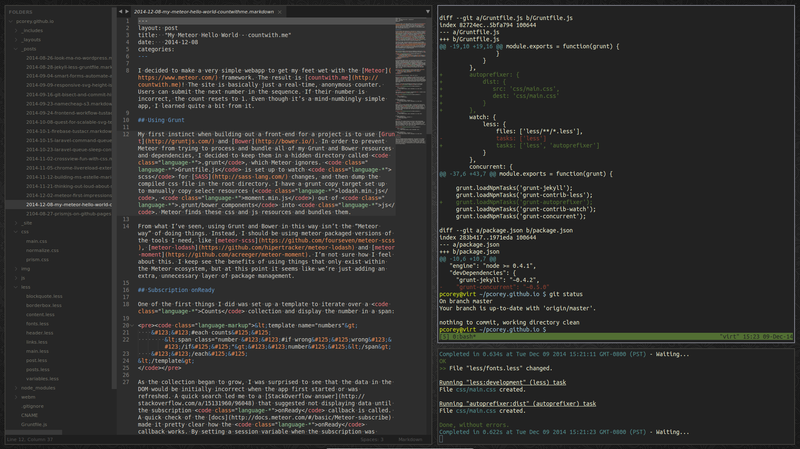 This should leave you with a minimal, functional and clean bspwm setup. There’s definitely much more that can be done from here, but the road you take is up to you. Check out all of my dotfiles on github. Written by Pete Corey on Dec 8, 2014.